London is plagued by street gangs. By the year 2016 there were an estimated 3,600 gangsters. According to government figures, these form some 225 gangs. 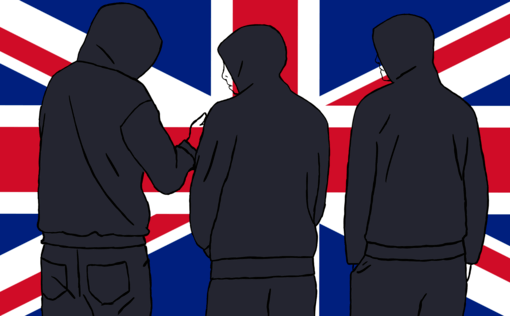 Of these, 58 gangs are regularly active and are thought by police to be responsible for two-thirds of gang-related offences, including assault, theft, murder and, most of all, drugs. Ethnically, gangsters are mainly white, Asian, black and Eastern European. In the absence of official data, on-the-ground reports suggest that the majority of gangsters dealing in drugs, where the most violent crimes occur, are young black males, particularly Jamaican. This is not only a symptom of how successive British governments have failed young ethnic minorities, it reflects the tragic legacy of colonialism. Jamaica’s pre-Independence gangs, like The Yardies, emerged from the poverty of the 1950s. Caribbeans experienced similar hardships when they and their parents moved to the UK after the Second World War. According to the British National Archives, between 1948 and 1970, almost half a million people from the West Indies (including the Caribbean) came to Britain, many of them on government initiatives, “to run the transport system, postal service and hospitals. Other West Indians were returning soldiers who had fought for Britain during the Second World War.” Most of the immigrants settled in London. One academic paper notes that “Britain’s experience of West Indian immigration” was “traumatic … Both first and second generations in the U.K. have experienced open hostility” from media, politicians and the public. Inner city violence, including white gangs vs. black gangs, affected Liverpool in the north, Handsworth in the Midlands and, in London, Brixton, Notting Hill and Tottenham. Within a generation, poverty and discrimination in London had given rise to the gangland culture, with children growing up poor and oppressed and turning to crime for prestige and money. In 1992, the British police launched Operation Lucy to crush the gangs. Not having learned their lessons, successive governments, including the Tories under Margaret Thatcher and John Major, as well as New Labour under Tony Blair and Gordon Brown, failed to address the grievances of young ethnic minority Britons–the children and grandchildren of the migrant generations–and help them integrate into society. As in previous decades, some youngsters of this neglected generation have turned to gangs for profit and protection. Britain has been condemned by the United Nations for its structural racism. Just 14% percent of British people are from ethnic minorities. Yet 26% of British prisoners are non-whites, with black offenders 53% more likely to be sent to prison than whites. By 2011, black people were, in some areas of the UK, 28 times more likely than white people to be stopped and searched by police. The children of black Caribbeans are three times more likely than white children to be permanently expelled from school. According to government figures, by 2016 the rate of employment for white Britons was 74.7%. For black Britons, however, it was 59.3%. While the rate of overall poverty for white Britons (according to the government’s questionable measure of poverty) was 17.2%, for black Britons it was 39.9%. The percentage of white people likely to get a good degree at college is 76.3% compared to 60.3% for ethnic minorities in general. Although just 7.3% of the British population supposedly experiences “persistent poverty” (again, by the government’s dubious measure), for black and Asian households, the percentage rises to 20. Poverty, unemployment, imprisonment and general discrimination put massive strains on ethnic minority families, hence many absent fathers. Twenty-two percent of white parents are single, but 51% of black parents are single. There are few means for ethnic minority women to make a decent living. By 2011, unemployment for ethnic women was 14% compared to 6.8% for white women. British governments used Caribbeans and their African ancestors as slaves and then as cheap labour to rebuild post-war Britain. Having been exploited, they and their offspring have been left to face poverty and discrimination. Another indication of how badly the system has failed these young, mainly ethnic minority males is the extent to which many believe in casting magic spells (Obeah) for self-protection. Here, the link between modern gangland violence and colonialism is apparent. According to a four-part investigation into London gangs by the International Business Times (IBT), Obeah originated in the west African Ashanti. Centuries ago, the practitioners believed that their spells could protect them. The magicians were respected and feared. The Spanish and later English slave traders brought them and their tradition to the Caribbean and thus to modern London. The IBT investigation concludes that many of today’s black London gangsters believe that Obeah will protect them from the police and bullets of rival gangs. It is significant that in the past the practitioners of Obeah “played a key role in slave rebellions and would create powders that supposedly possessed magical properties that would protect users from the white man’s weapons.” Today, the white man’s weapons are job discrimination, racism in policing, an economic system that favours wealthy and middle-class people, and the refusal of successive governments to get to the root of what drives young males to join gangs. Like so many things, London’s gang crisis is in no small part one of the tragic legacies of colonialism.